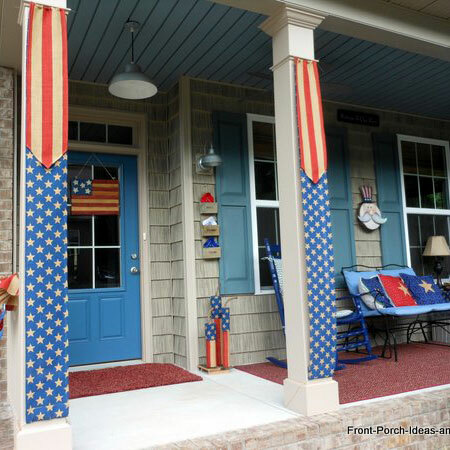 Our homemade firecracker decorations are perfect Americana decorations for celebrating the 4th of July on your front porch. 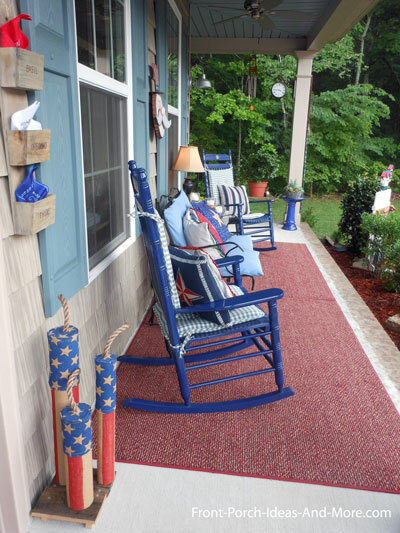 Mary and I love how they complement our patriotic American flag and our other 4th of July craft ideas we used to decorate for the holiday. 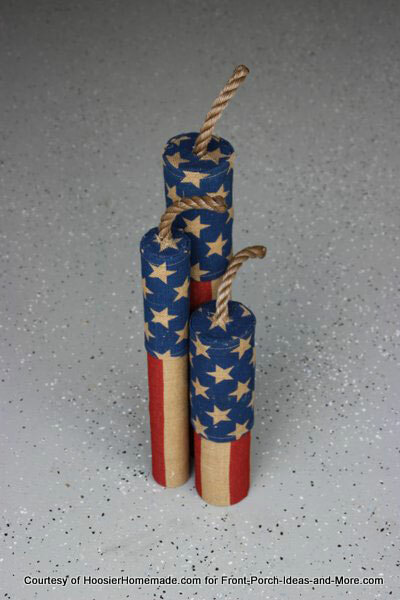 Our friends, Doug and Liz, with HoosierHomemade.com, helped us create these festive Americana-style firecracker decorations. They are inexpensive and so easy to make you just might want to create several sets for family and friends. 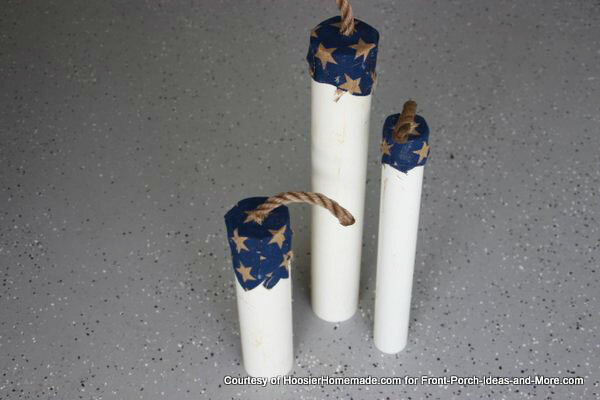 Want to make some homemade firecracker decorations this year? Nothing says the 4th of July like firecrackers. Raid the frig for plastic butter lids, find some PVC pipe, a little rope, some Americana-style burlap, and a glue gun to make these fun decorations. Doug and I made these using Americana-style burlap that Mary and I found at Walmart. Actually it was leftover from making our patriotic porch banners. 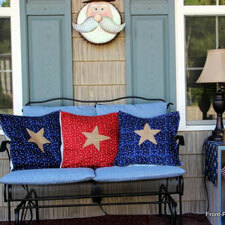 Another option if you can't find similar burlap is to get solid red and blue burlap and maybe paint stars on it. We used scrap pieces on hand; however, you can purchase PVC pipe relatively inexpensively at your local building supply store. We selected the sizes listed below based on our available pieces of PVC. You may want to make yours taller or shorter depending on your own desires. 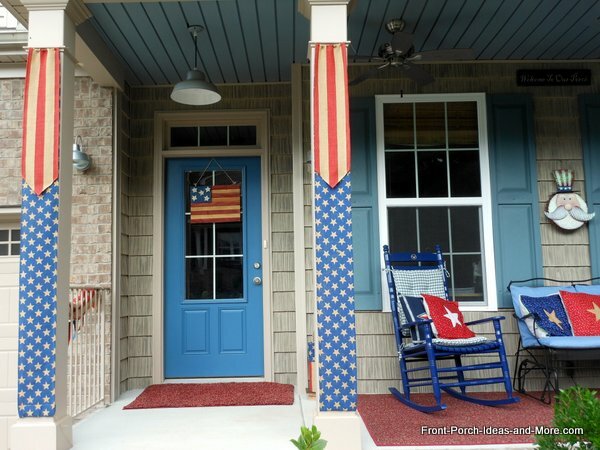 We used Americana-style burlap and purchased enough to make banners for our porch columns and a few other 4th of July crafts. Fortunately, we had enough scraps left over to make these firecrackers. 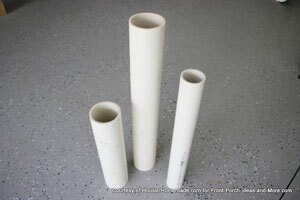 It didn't take much to cover our pvc pipes; however, be sure you purchase a sufficient amount. 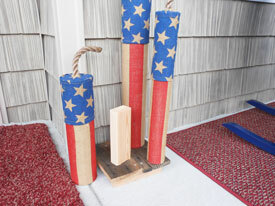 If displaying your firecrackers indoors, other fabrics would work as well. I actually emptied several plastic containers in the fridge so I could use the lids. Hopefully, you won't have to do that. Mary was wondering why the yogurt was in a different container! I purchased 18 inches (six inches for each firecracker) of rope at a building supply store. 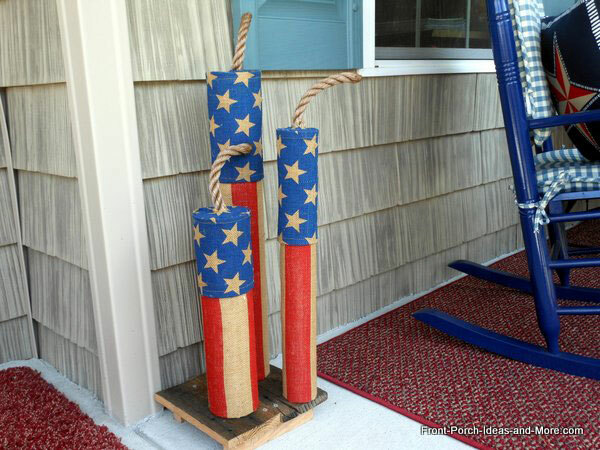 I used a heavier twine-type rope so it would stand above the tops of the firecrackers. Doug and I used a significant amount of glue so be advised! We used the nails to secure the rope to the plastic lids. Cut PVC to the lengths you desire. Cut an X in the center of each plastic lid just large enough to insert a piece of rope. 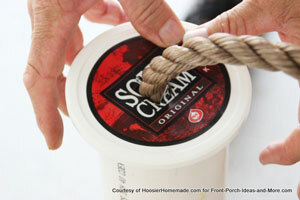 Insert the rope and secure by inserting a nail through the rope on each side of the plastic lid. Place hot glue on rim at top of one end of the pvc. Attach lid to hot glue. 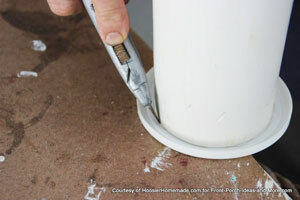 After the glue cools place PVC with lid down on a piece of scrap wood. 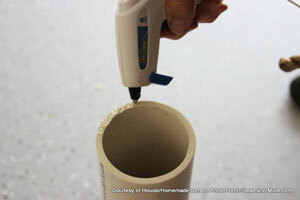 Use an box cutter or other sharp knife to cut the excess plastic away from the PVC pipe. Repeat step 3 for each piece of pvc. 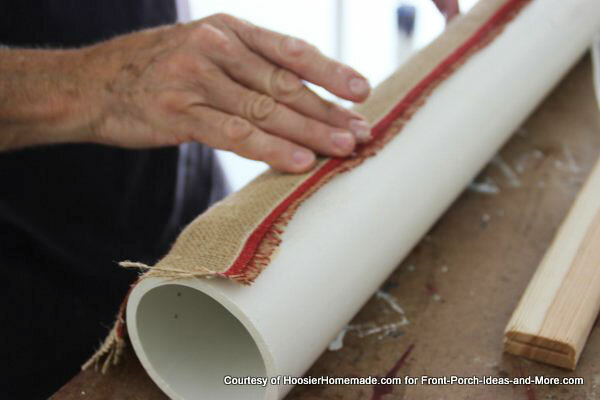 Cut a piece burlap to cover the top of the pvc. You will need to cut an X in the center and insert it over the rope. Use a hot glue gun to secure it to the top of the plastic lid. 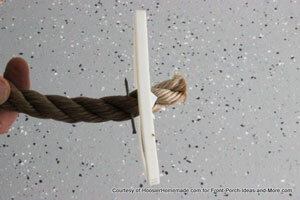 I also put a small amount around the rope where it meets the plastic lid. Doug and I said "ouch" a lot - hot glue is well, hot! Calculate the amount of burlap needed to cover the PVC. In our case we used two different burlaps, one for the lower section and one for the top section. 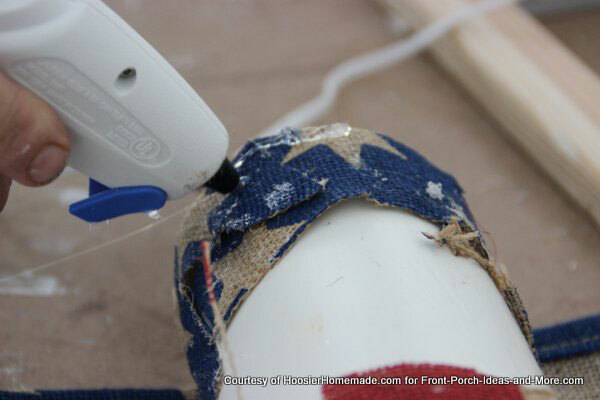 Lay a bead of hot glue along the side of the pvc as shown. If using two different burlaps as we did, cover the lower section first and secure using a hot glue gun. 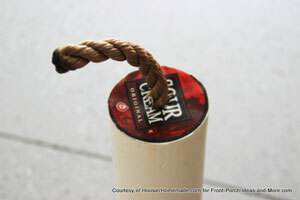 Tuck any remaining burlap up inside the bottom of the PVC and secure with hot glue. 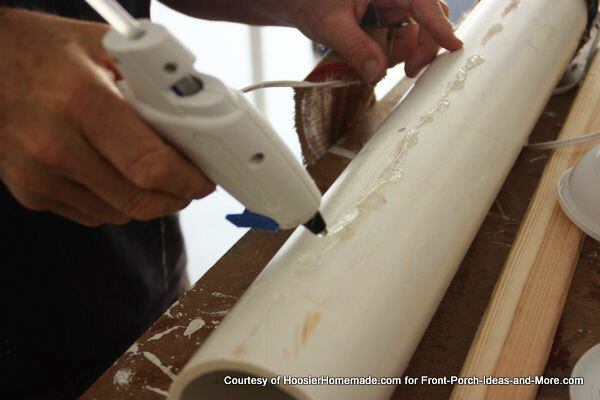 Next, wrap the top portion of the PVC and secure with hot glue. 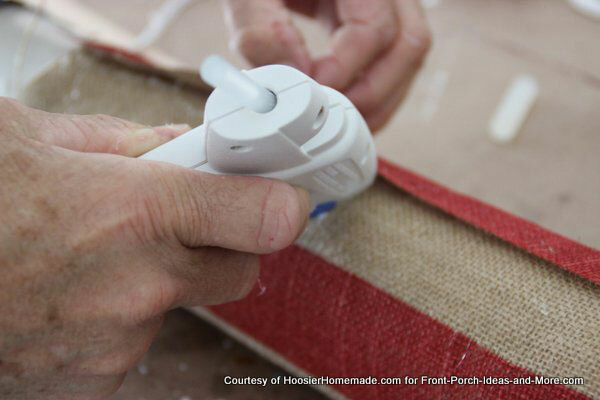 In the photo above, glue is applied along the top (which is already covered with burlap) in order to secure the overlapping top burlap section. Although not pictured, the top overlapping burlap section is attached in the same manner as was the bottom section. Ensure the seams for both the top and bottom burlap align; otherwise, it will make it difficult to display without a seam showing. 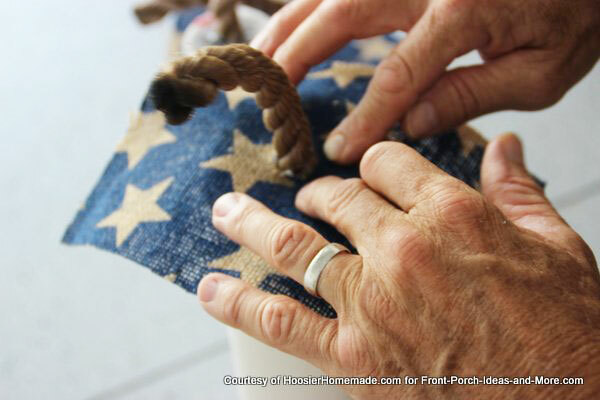 NOTE: To give your homemade firecracker decorations a finished look, recommend you hem the top portion of burlap using a sewing machine or by hand sewing before gluing to the PVC. Place on porch and enjoy! 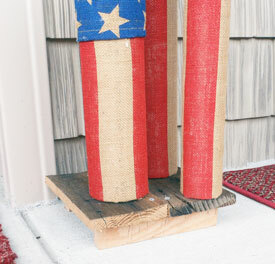 To make the homemade firecracker decorations more stable on the porch, I constructed a little stand out of scrap wood. I cut 2x4s about 8 inches long and ripped them to fit inside the PVC. I then attached them to the stand with screws and slid the PVC over them. 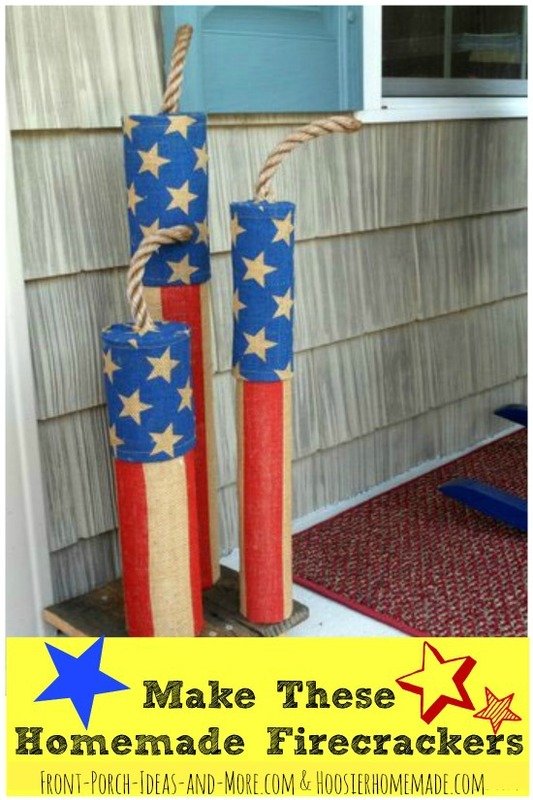 Doug and I enjoyed making these homemade firecracker decorations and know you will too. I could see making another set and placing them on either side of our porch columns. Be sure to see our Americana Flag, 4th of July bird houses, and our patriotic banners - just a few of our many 4th of July decorating ideas!